A collection of articles, turned into a book. As I’m neither an art critic nor an art historian I’m going to restrict myself to a chapter-by-chapter summary of the ground covered. A useful overview of colonial period art. Highlights the difficulty of studying & researching the art history of the period, in part because of the interconnectedness with Japanese art history, the complications of colonialism, and also because of more practical considerations that much of the artwork has disappeared or been destroyed, and that many of the artists ended up in the North and so it has been difficult to get access to them and their works. One thing to come across quite strongly is the fact that, at least initially, Korea was getting a rather second-hand view of western modernity in general and modern trends in Art in particular: everything they saw was introduced via Japan as part of that country’s colonialist/modernising agenda. Slightly off-topic, but nevertheless interesting, this chapter describes Korea’s encounter with the west via participation in international expositions. There are some interesting eye-witness accounts (an interesting snippet: the Korean delegation seemed to get hold of the wrong end of the stick in one of the shows: in an expo devoted to modern manufactures, the Koreans brought along a 400-year-old cannon to their pavilion); and some quotes from the official court records – the king interrogating the leader of the delegation as to how the show went. A chapter about modern women – how they were depicted in the media and in art, and how they participated in art, and how women generally were portrayed in art. A chapter which I shall go back to. 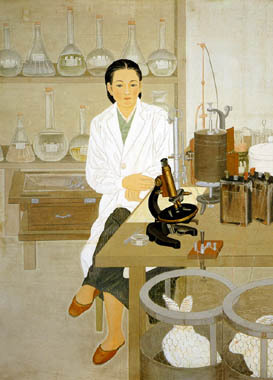 Image (above right): Yu Yi-tae “Research” (1944) from WolganMisool. Slightly off-topic, but while writing this post I came across this article in the Chosun Ilbo about the changing role of women as shown in Choseon dynasty genre paintings. A puzzling chapter which discusses the influence on high art of the immensely popular works by Millet. The conclusion is: they had no influence. A necessary but rather pedestrian chapter cataloguing the works of Korean artists who studied and worked in Japan. This chapter is the first which deals with Korean artists experimenting with abstraction. Introduces the post-liberation trends in Korean art. 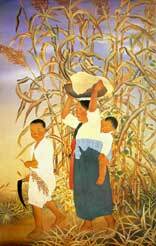 Freed from colonial oppression and the horrors of the Korean War, Korean art blinked in the sunlight. There seemed a lot of catching up to do with what was happening in the West, and for the first time Korean artists were able to engage directly with Western influence without the mediation of Japan. Experimentation with various styles and forms of abstraction followed, but ultimately there was a feeling that the work was derivative, despite some groups’ exploration of traditional folk-painting themes or use of traditional techniques such as ink painting. The reaction was two diametrically opposed schools which Kim sees as both attempting to portray essential Koreanness: Monochrome painting and minjung art, the latter of which arose out of protest at the oppressive developmental policies of Park Chung-hee and Chun Doo-hwan. Chapter 11 spends more time on the movements of the 70s and 80s which sought to reunite Korean art with some of its past traditions. Kim places these movements in the context of the nation-building atmosphere of the Park Chung-hee era. The minimalist “monochrome” artists sought harmony with nature in the creative process, while the simple colours evoked the purity of Choseon porcelain. The Minjung artists, however, sought to revive more populist forms, folk art, Buddhist art, as a way of communicating with people and mobilising sentiment against the oppressive growth-led economic policies of the dictatorship: particularly powerful illustrations are the works of Lim Ok-sang – Earth IV, which shows a bloody wound made in the countryside by construction or quarry work, and Barley Field II, which shows traumatised and haggard factory workers returning to the fields like automata. 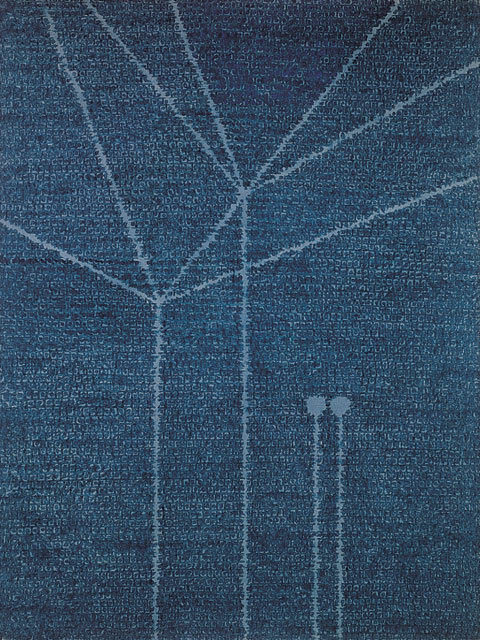 Image: Lim Ok-sang: Barley Field II, 1983, from Darmstadt Kunsthalle. The final chapter, written in 1998, pulls together some observations from the post-democratisation period. Overall a very user-friendly introduction to the topic. I leave it to others to opine as to whether its coverage is balanced and its assessments fair. But from my perspective it was a good buy.